Detail of Guy Dill’s bronze piece “Ferric” with “Alee” in the background. 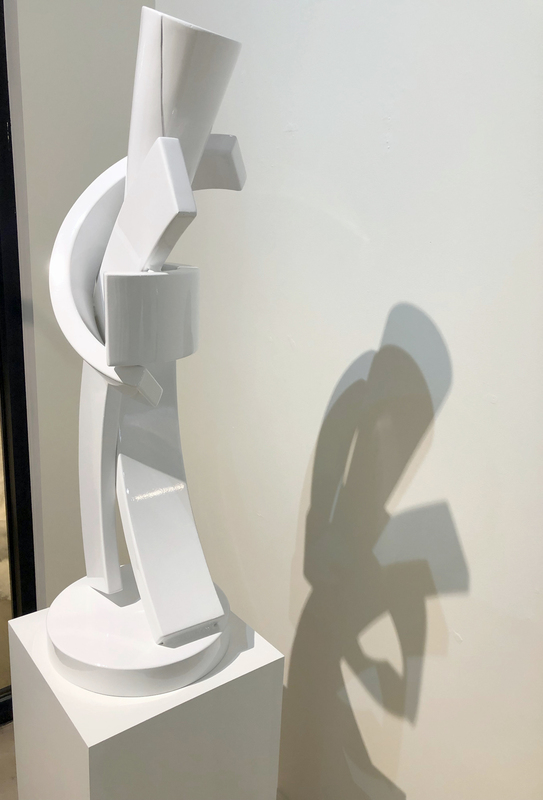 “The artist Guy Dill has carved out a unique niche for himself on the borderline between abstract and figurative sculpture.” That’s the metaphor that first comes to mind, but the thing is, it doesn’t really work, because he doesn’t carve. 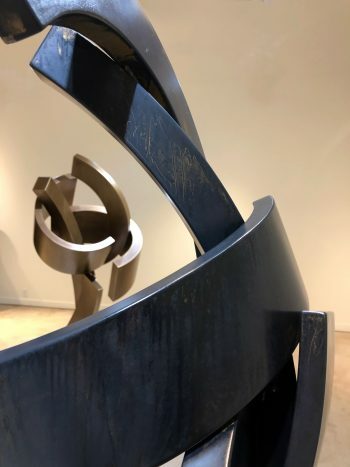 They’re assembled in that distinctly American geometric style, influenced by abstract expressionism, that runs from David Smith, the first American to achieve international status in sculpture, to present-day Utahn Cordell Taylor. Yet within that tradition they stand out immediately for the way Dill departs from each of the several conventions adopted early and observed by almost every artist since. First of all, there’s the matter of size. As Smith’s technique became simpler, his sculptures grew larger, until they became massive. Some of his successors’ installations reach architectural size as well as form. Their often brutal, masculine relation to their audience has not gone without notice. The seven objects at Julie Nester are all carefully matched to the size of their viewers: four are 5 to 6 feet tall, give or take small pedestals, while the other three are each half that, but stand on taller pedestals, so that all seven are about the same height. In other words, they are all scaled to the measure of their audience, and in fact are shaped like them as well. Most have a couple of leglike struts that support more complex upper parts, like the way legs and torsos lead up to the place where faces encounter faces and arms reach out to arms. One of them, “Marine,” even has a Picasso-esque, or should you prefer, a Modiglianilike oval face that seems to rest in the palm of its — or her — hand. That suggestion and their overall size are not the only figural qualities they possess. All are narrow for their heights, so they share an upright, human posture. Most also display a graceful, dancelike movement, seeming both to rise and to rotate at the same time. Typically, sculpture of this type steers closely to Cézanne’s small vocabulary of geometric forms: cube, cylinder, cone, etc. Like fabled nature, Dill’s world has few straight lines, and they come only at the ends of much longer curves. In public sculpture gardens and corporate offices, works like these often have windows or gatelike openings, as though inviting the viewer to contemplate the view or step through, but Dill’s semicircular slabs bend and wrap around their supports, like arms or rib cages, producing an awareness of their own interiors. At least three of them, “Alee,” “Hayden,” and “Belay,” achieve a striking ambivalence, first appearing completely unified, then alternately suggesting a couple dancing in each other’s arms. 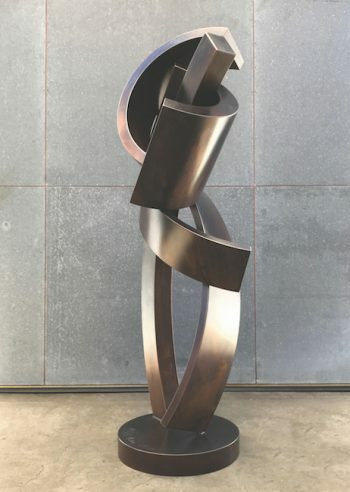 One of the most influential innovations welded-steel sculpture made, not only to the vocabulary of art, but to industrial and architectural applications as well, was in the matter of surface finishes. Sculptors long ago learned to imitate the various patinas that statues acquire from standing out in the weather. Stained and eroded, marked by and redolent of the horizontal wear of wind and the downward flow of water, they constitute one superb example of how nature not only knows best before the artist begins, but continues to make improvements after the work is done. Cor-Ten steel was formulated to control oxidation by developing a protective coat of rust that prevents further deterioration. Sculptors learned to produce a range of red and orange colors that give it an expressive character. Stainless steel, when wire brushed and struck by direct light, produces hallucinatory optical effects that are as close as industrial materials come to magic. Sculptors learned to use those, as well, to their advantage, leading to possible overfamiliarity of these two splendid effects. Just as he’s taken his own direction on scale and curvilinear form, Dill follows his own lead with surface finish. Three of these pieces are powder coated in white. Powder coating is similar to the thick-looking, creamy enamel that stoves and some other appliances used to come with. Done right, as it is here, it’s a flawless, featureless skin that permits underlying shape to show itself with the subtlest gradations of light: to speak as distinctively as painted contrasts, but in ways that respond to the ambient light. In “Strongs,” pieces that overlap like shingles conspire to never present the same angle, hence the same color, twice. In “Ferric,” the interplay of bronze and iron colors suggests the layering and veins of some sedimentary, marblelike stone, while in “Alee” a velvety texture on the eye suggests a caress to the skin. 37” x 14” x 12,” with shadow. Such formal suggestions and material resemblances mark one end of the spectrum on which these constructions reside. On the other hand, they are pure abstractions. Surely the artist must want the viewer to see them this way, or so his titles strongly suggest. And indeed, there is much to be said for the sheer pleasure of contemplating them as objects of fantasy, of pure thought magically made visible. The timeless combat of mind and body is re-created in the way they are palpably material overall, yet in places they float as though weightless and free of gravity, their ends turning up where they’re expected to touch the ground. Every characteristic described here has one other quality, and that is the familiar, though not always noticeable, difference between the dumb frustration of the photograph and the dancing joy of actual seeing. Our eyes and ears were not only made to operate in pairs, but to move while doing so. 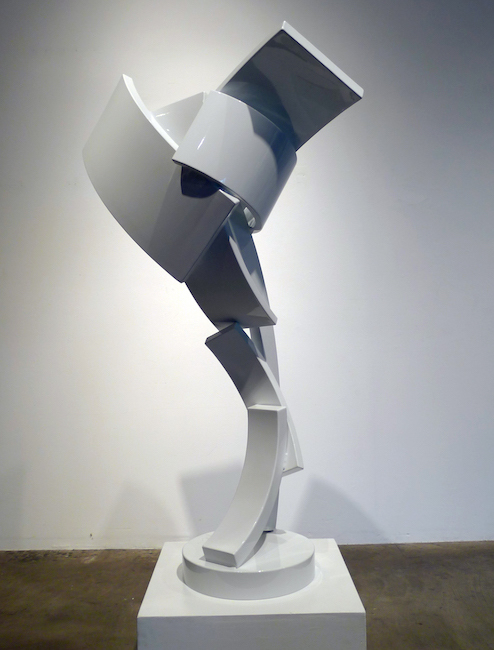 Seeing Guy Dill’s sculptures in person is the visual equivalent of hearing music in stereo, and while doing so, and afterwards, the old, academic claim that sculpture energizes the space around it makes a whole new kind of sense. Guy Dill, “Selected Works from ‘Los Angeles’ and the ‘White’ Series,” Julie Nester Gallery, Park City, through February 26.